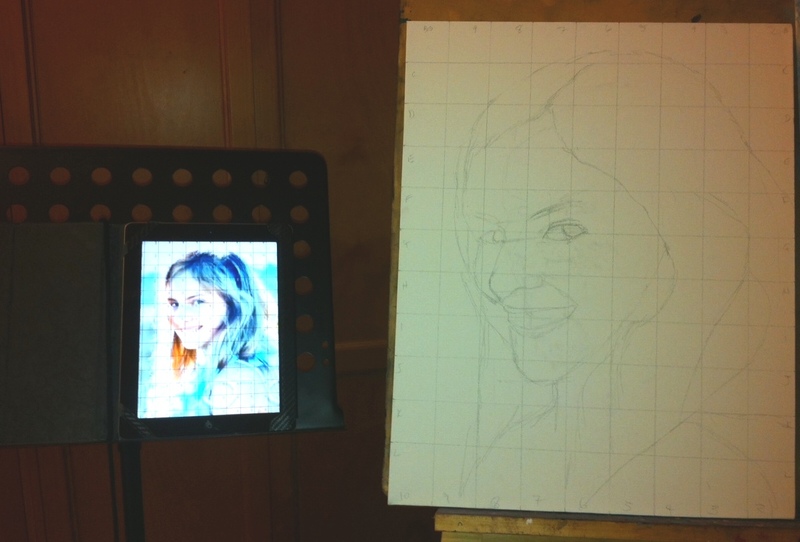 Time to dust off the paint brushes and prise the lids off the paints: it’s my first oil portrait painting for quite some time. I’m very excited about this one. I was originally approached to do this portrait two years ago but for a number of reasons, it has taken a teensy little while to settle on a reference picture. 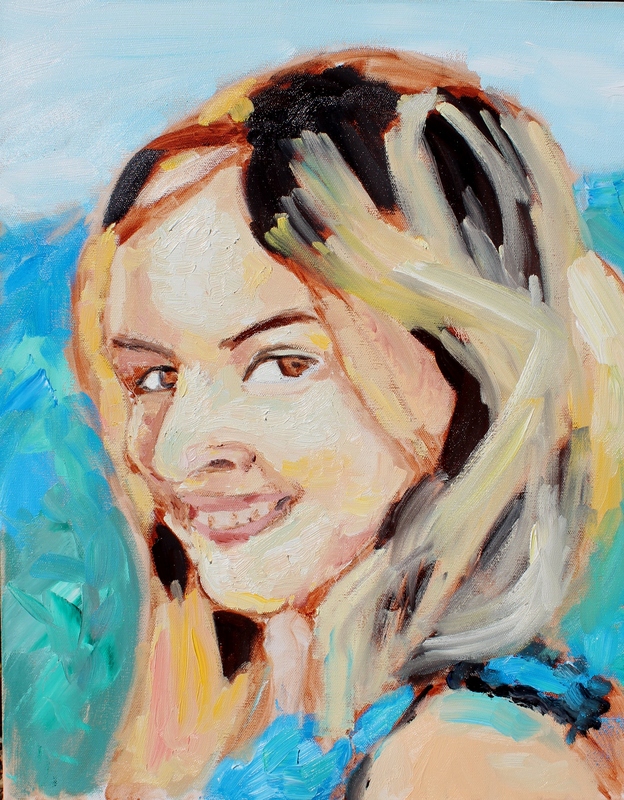 In the meantime, my subject has grown from a quiet 10 year old into a beautiful 12 year old – “child portrait painting” seems a bit of a misnomer, now. 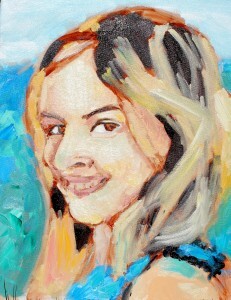 I approach oil paintings differently depending on the outcome I want. If I am painting for my own pleasure, I will do a rough oil sketch and refine the details as I go along, similar to the way I worked in my charcoal workshop. Emotion and energy is usually the focus rather than exact likeness. When painting for someone else, of course likeness is very important and I feel more comfortable if a reasonable likeness is established early in the piece. I have a new app on my iPad (have I mentioned that I love my iPad?) called CopyIt which applies a grid to reference photos. I do this and then scale it up and draw a large grid on the canvas. 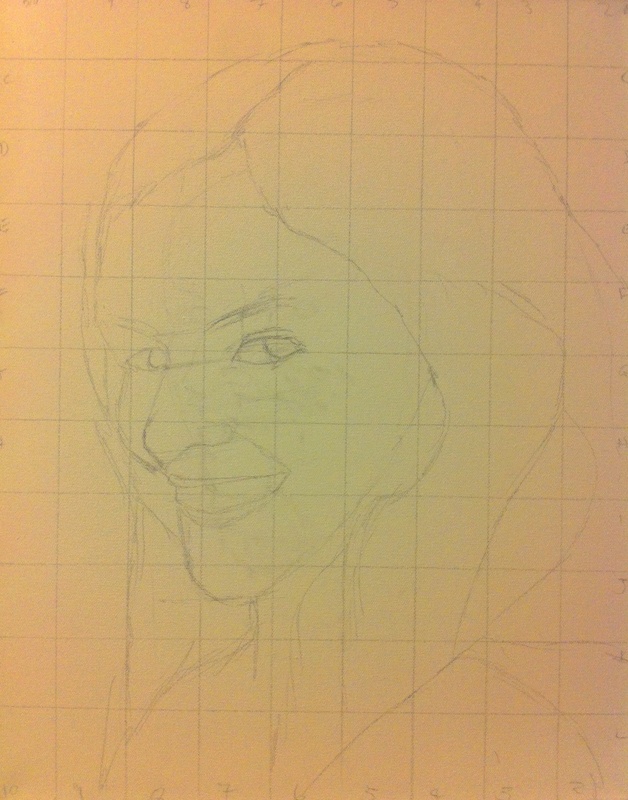 I then do a loose drawing using the grid to establish points of reference. 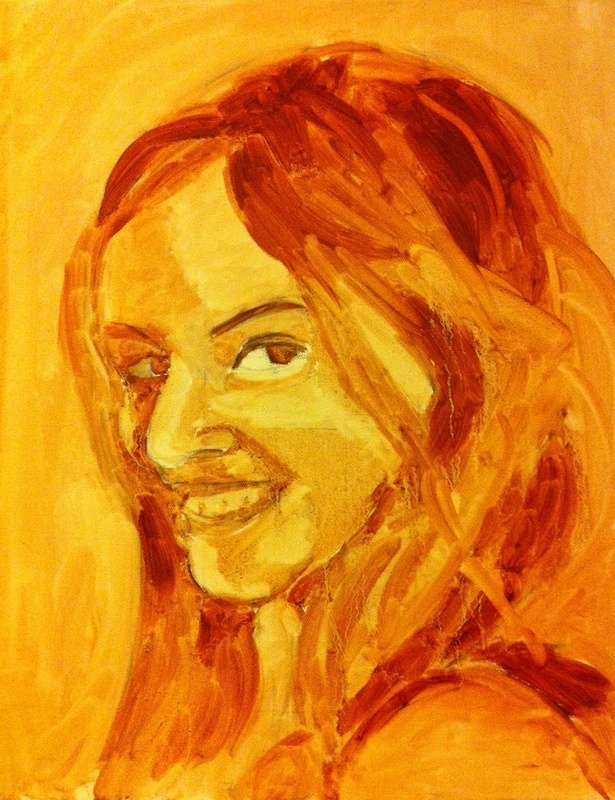 Then I create a sketch using burnt sienna and odourless solvent. You can see more character already in this sketch. I wait a few days for this sketch to dry then I crack open the paint box. Studying the reference photo, I find that Ashley’s skin tone leans more towards yellow than red. There are a lot of cool colours in the lighter areas and warmer colours in the darker areas. Ashley’s hair is cooler in colour on her left and warmer on her right. So my preliminary attempt at mixing a skin tone is lemon yellow (green-yellow), quinacridone violet (violet-red) and a ridiculous amount of white. I use more yellow than red so that the colour will lean more towards the yellow. I mix three shades: a midtone, a lighter one with more white and a darker one with burnt sienna added. It is important to work on the painting as a whole to see how the colours interact with each other during the creation process. So, while I am painting the skin, I also paint some Pthalo Blue & Pthalo Green into the background and a mixture of Pthalo Blue and white for the sky. I then bring some of the Pthalos into the cool areas of the skin. Using the same colours throughout the paint helps achieve harmony. I will probably reduce the intensity of the background colour at some point but will leave that decision for later. For the lip colour, I mix burnt sienna, violet red and white. I decide I quite like this colour, so also add it to areas where the skin will be warmer. 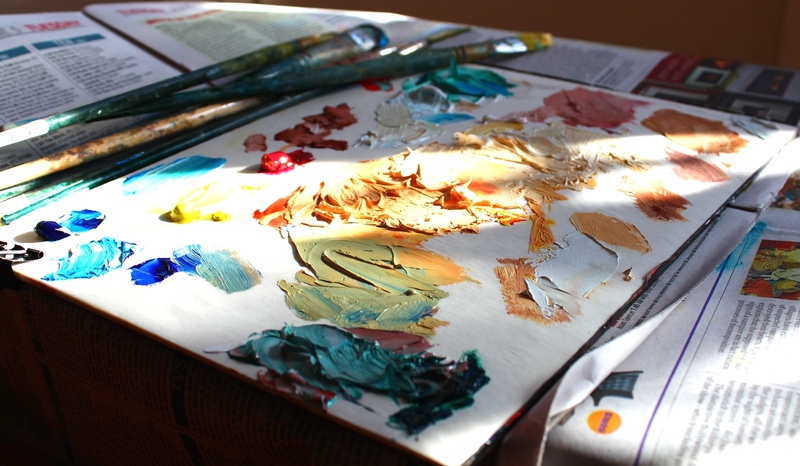 Blonde hair is always tricky, but just to lay something down, I use burnt sienna + ultra blue (violet blue) for the dark areas; yellow ochre + white for the warm areas and a combination of raw sienna, green-yellow and white for the cool areas. I also add dabs of cadmium yellow light (orange yellow) here and there and bring this into the face as well. There is quite a lot of texture the paint and while I love portraits with thick, expressive brush strokes and loads of texture, I don’t think Ashley’s face calls for texture at this point. I use my fan brush to gently smooth out the paint. This creates softer transitions. 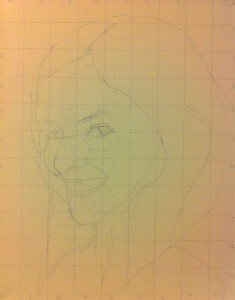 I haven’t started the eyes yet – that will be in the next session. I always start out with good intentions and mean to arrange the colours in an orderly fashion as I was taught to… but I guess I am just messy by nature. You can read my tutorial on colour here where I discuss the temperature of colours.